Authorities in Bay and Saginaw Counties are signing a new protocol Thursday night allowing them to better serve victims of child abuse and neglect. The Child Abuse and Neglect Council, or CAN Council, has rewritten and updated the practices for dealing with child abuse and neglect at all levels. The CAN Council offers an array of service to help children and families dealing with abuse and neglect. Cynthia Morley is with the council. “We offer those services to help through prevention and intervention and also advocacy to help our families and children,” Morley said. Renewing the protocols allows advocates to re-visit the protocols, updating and adding to them. Notably, Saginaw County workers are now able to tape interviews with victims and use those tapes in court. Since 1999 the CAN Council has helped more than six thousand children. The Michigan State Housing Development Authority has awarded over $2 million in housing resource fund grants to seven counties and three cities. Grant money being awarded to Michigan counties and cities will go towards home rehabilitation and emergency repair projects. According to he state housing authority the projects that stem from the grants will create a positive and sustained community impact. Antrim county has received $175,000, half of the money will go towards emergency repairs to homes and the other half to strategically targeted areas. Other counties being awarded are Emmet, Kalkaska, and Gladwin. September 11th is a day of remembrance. For some local volunteers it’s also a day to give back. Americorps members from Huron Pines along with local Eagle Scouts and community members will take this morning to beautify the ground of Patriot Place, Northern Michigan’s only transitional housing community for veterans. Volunteers will be building birdhouses and toad houses and removing invasive plant species from the grounds. Joy Leisen is an Americorps member at Huron Pines. “We really just want the veterans that are living their to be able to get more enjoyment out of their gardens,” Leisen said. Volunteers will also be completing a memorial garden on the grounds of Patriot Place. Any community members wishing to help with effort can arrive at Patriot Place on today at 9 a.m. 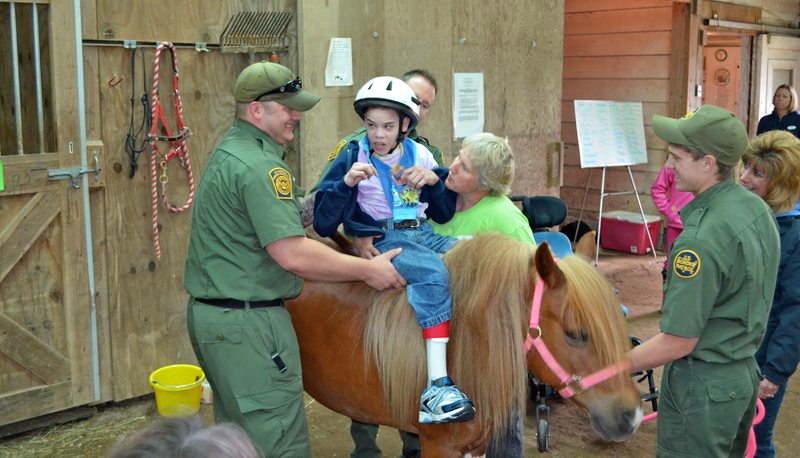 The 4H horseback riding program for handicapped kids in Chippewa County has a little giddy-up in its step this year, thanks to help from some volunteers and a new partnership with Sault Schools. Ten students from Sault-area schools took part recently in a 4H horseback riding program for handicapped kids in Chippewa County. The program benefits kids with emotional, physical, and social challenges. School officials said it can help the students maintain skills over the summer months. Norma Osborn has coordinated the PEP program for the past 40 years. She said many people have never heard of the nationwide program. PEP stands for 4H Proud Equestrian Program. She said it also referred to as a therapeutic riding program and a handicapped riding program. PEP relies on help from volunteers, even down to the location of the program, at a large horse farm in the Sault that’s currently for sale. The owner boards his own horses elsewhere during the program and even barbecues lunch for the volunteers each day. The Central Michigan University’s student organization Campus Grow this year is donating more than 500 pounds of fresh organic produce to the community agencies. Campus Grow has a garden run by students. The organization began five-years ago when students wanted to have sustainable agriculture around campus and in town. Today they have a 6,000 square foot garden, and rent out plots to students and community members. Courtney Lorenz is a member of Campus Grow and has been gardening for 3 years. She says this is a great way to introduce people to gardening. “A super cool way for people to get involved in the community you don’t have to be a student it’s open to all community members if you don’t have space in your apartment and want fresh food this is the way to go. People don’t realize how easy it can be to garden once you get the hang of it. It’s really rewarding to get your own food,” Lorenz said. Lorenz said she currently has 130 tomatoes waiting to ripen in her two plots. She’s described as a “legend” in the field of alcohol awareness, and this week she’s being honored with a national award. Penny Norton is the founder and CEO of the group “Facing Alcohol Concerns through Education,” or FACE, located in the small town of Clare. This week, she received the Lifetime Achievement award from the organization SADD, or Students Against Destructive Decisions. SADD CEO Penny Wells said Norton and her organization has had a national impact in her efforts to reduce alcohol abuse. The materials that have come from FACE, the leadership she’s shown from Clare, Michigan, is really remarkable and has been respected to all corners of the United States. After nearly a quarter century of work, this is apparently the last year for Norton’s organization. The FACE website said due to a “prolonged economic downturn” the office will close in January.